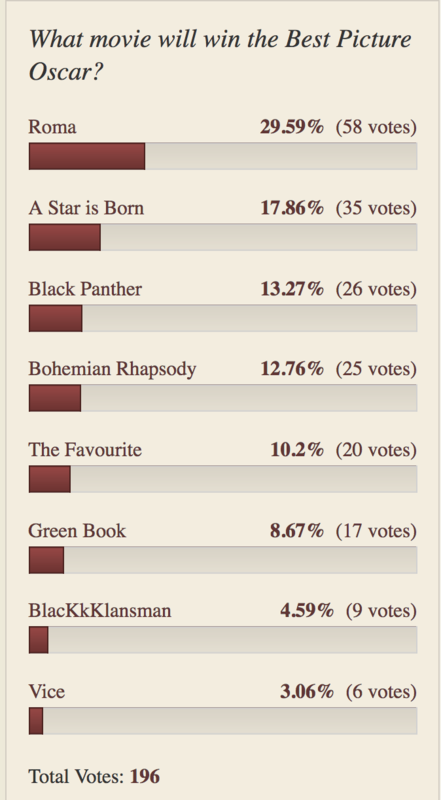 Here are the results of yesterday’s polls about which films, directors, and stars would win this year’s Oscars. 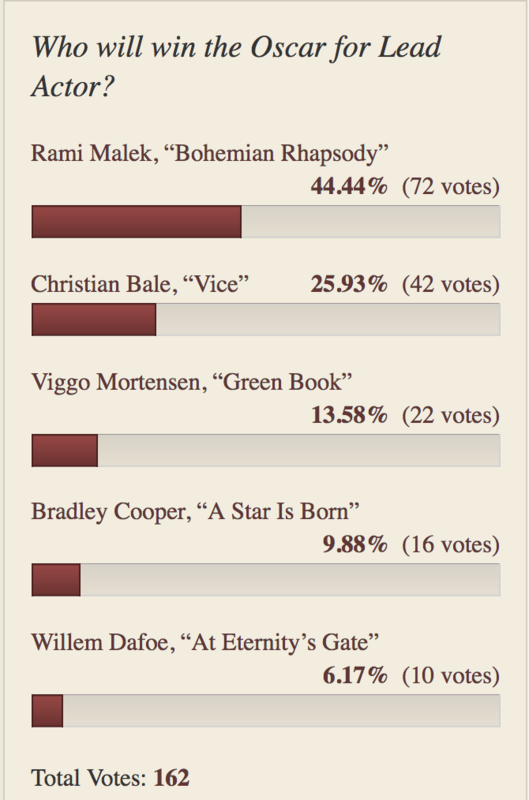 (I have to say that I’m somewhat disappointed at the paucity of votes given the number of readers). Here you go, but of course you can continue to vote as well as guess in the comments who will win. There’s a prize for the first commenter to get all six right, and if nobody does perhaps there will be a consolation prize. As you see, “Roma” leads for best picture and director, while there’s a melange of movies whose stars garnered the other prizes. As I haven’t seen any of these movies (mea culpa), it looks as if “Roma” is the one I should see first. This entry was written by whyevolutionistrue and posted on January 24, 2019 at 1:00 pm and filed under awards and honors, movies. Bookmark the permalink. Follow any comments here with the RSS feed for this post. Both comments and trackbacks are currently closed. I haven’t seen any of those movies, and probably never will. I felt that I shouldn’t vote for the same reason. Instead, I am rewatching Newsroom in its’ entirety. I really enjoyed The Newsroom, with Emily Mortimer and others. Cos it’s you, I will give it a go then Merilee 🙂 ~ it’s cheap on the YouTubes. The three series are in reverse order of ratings unusually – 3rd series rated highest. Understand or heard reports the guy who directed Bohemian Rhapsody is in some trouble. However, he was not up for an award as director. BlacKkKlansman was brilliant. It was serious. It was funny. The audience laughed out loud multiple times but left taking about how it impacted them emotionally. I highly recommend it. As I was watching it, BlacKkKlansman struck me as something of a throwback to some of Spike’s earlier work, like School Daze. I liked it a lot, especially Topher Grace’s nifty little turn as David Duke. This is one of the few contenders that I had managed to see. I thought it very good, and I am rooting for Spike Lee to get the best director oscar – in large part because he has been consistently good for many years. “…in large part because he has been consistently good for many years”. Surely this is a reason for a lifetime achievement award not for ‘Best Director’ in a specific year? 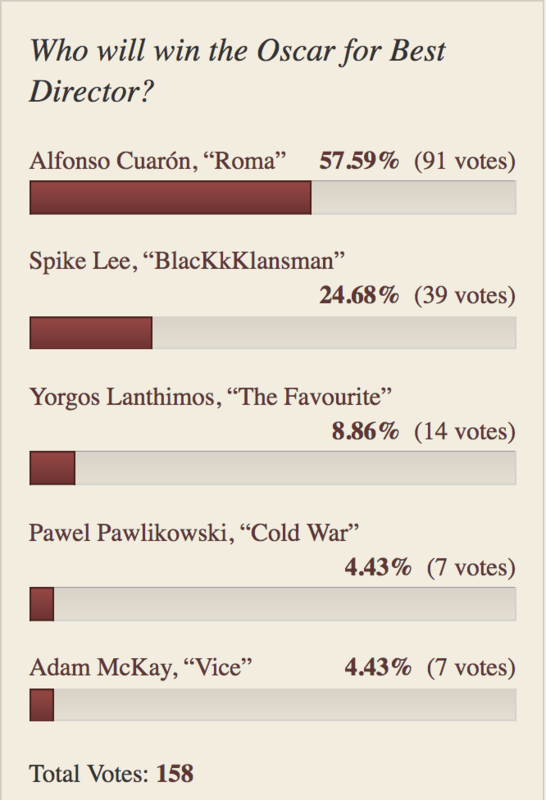 As it happens, I think BlacKkKlansman is an excellent film and worth an award in its own right, irrespective of the quality of the rest of Lee’s oeuvre. 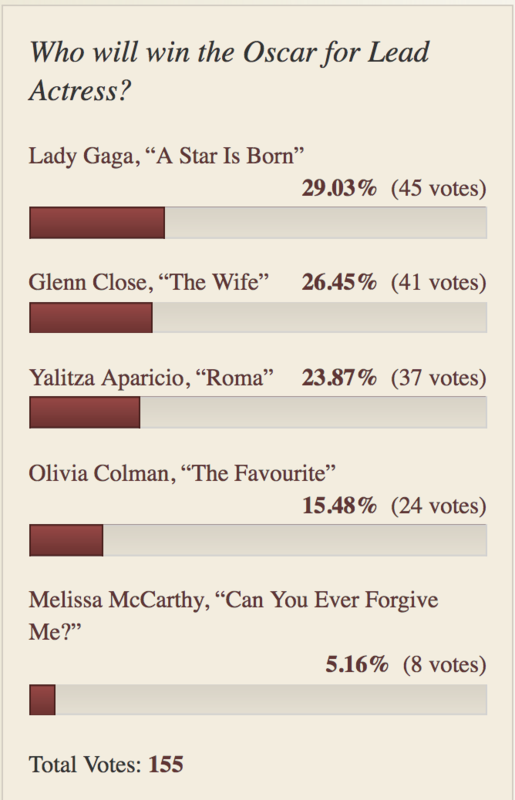 Whether it is the best of the nominees I have no idea as it’s the only one I’ve seen. I’d seen four, Roma, Star is Born, Black Panther and The Favorite. 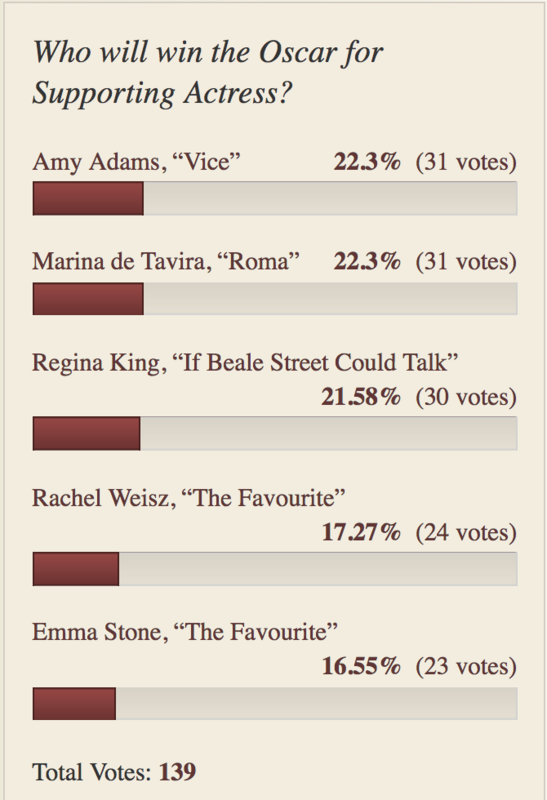 Of those, I probably enjoyed the Favorite the most. But it didn’t seem like a “Best Picture” – although the individual performances of the three leading women were all worthy. I quite enjoyed Roma but it didn’t really grip me. Always hard to decide on the best movie when you’ve only seen half of them. Personally, I think there were at least three of last years nominated films (Shape of Water, Three Billboards and Lady Bird)that were better than any of the nominees that I have seen this year. I didn’t vote, because I haven’t seen most of these, yet. 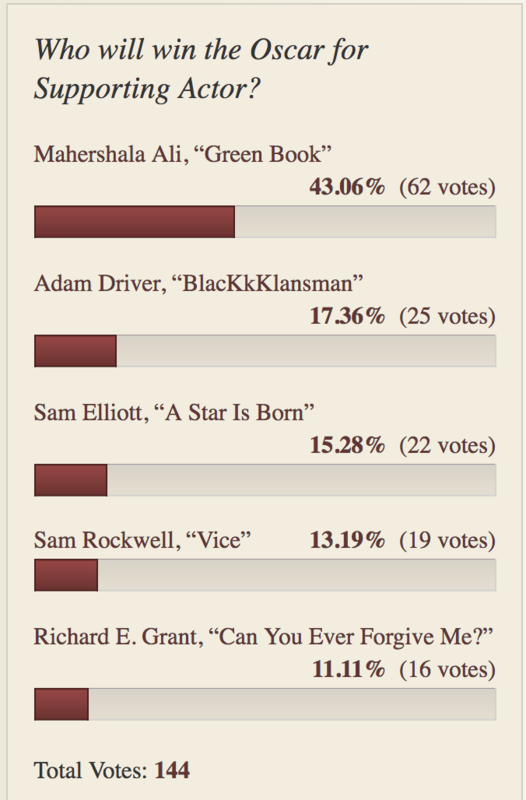 I hope Mahershala Ali wins. I have seen him in a number of things, and think he is a great actor. Three Billboards maybe for Best of Decade? Yes, 3 Billboards is excellent. It manages to pursue a (total) bummer of a story and not just depress me. Frances McDormand is great. I always Like Woody Harrelson in whatever he does. He’s great in 3 Billboards too. Great casting! I really like North Country, 2005. Charlize Theron, Sean Bean, Frances McDormand, Richard Jenkins, Jeremy Renner (in a really different role for him). Greta movie, great story. Not to forget Sam Rockwell! Thanks for the tip on North Country. Seem to have missed that one. The main reason I decided not to participate is that I don’t really care about the Oscars, especially since I’m not a big movie aficionado. The only movie I care about that has a nomination is Spider-Man: Into the Spider-Verse, and that’s for Best Animation, iirc. But speaking of movies, I thought Bumblebee was a good one. A nice change from Michael Bay’s version of Transformers. I have not seen more than 2 films in the last year! I have not seen any of these films. I have not been to a movie theater since 1980. I could have said something similar to that up until the last 6 months, when we started going again. And I have been loving it. Our local theater now has: Assigned seats! Big, recliner seats with TONS of legroom, with climate control. Smaller theaters (100-200 seats). A bar! Proper food! (Well, pizza, burgers, and such: but more than popcorn and candy!) It’s a very different experience than “back in the day”. You can buy seats the day before. My advice (unless you really don’t care for movies): Find a similar theater. I really want to see Green Book.